Recently, the major stock markets have hit all-time highs. For those individuals who want to donate to Boca West Community Charitable Foundation, the Foundation has arranged for a win-win opportunity for both you, the donor, and us, your charity. The information included here is intended for informational purposes only. You should consult professional advisors before making any tax, legal, or financial decisions. The chart above illustrates only the federal tax benefits. The benefits of not incurring commission costs for selling the appreciated securities yourself and additional state tax savings for non-Florida residents are not reflected in the above chart. For illustration purposes, let’s assume you are in the maximum tax bracket of 39.6% and normally make a $1000 contribution to the Foundation. Let’s also assume that you own 10 shares of a stock that you acquired for $500 more than a year ago, now worth $2000. 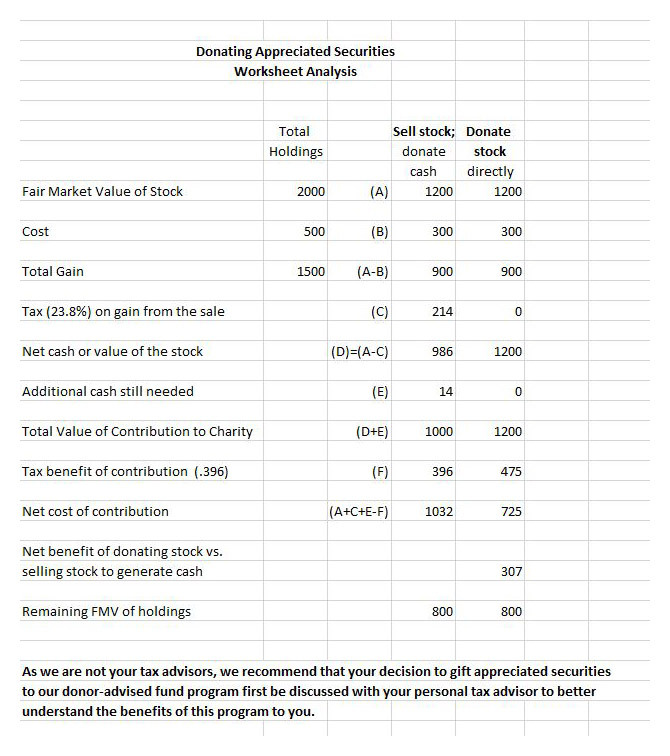 If you sell the stock to generate the $1000 to make your contribution, you will need to sell 6 shares to generate $1200 so that after taxes ($214 plus an additional $14 in cash) you now have the $1000 to donate. On the other hand, if you donate the 6 shares of the stock to our donor-advised fund program, the net after-tax cost to you is less even though you gave the Foundation more. This illustration assumes that this charitable tax deduction does not exceed 30% of your adjusted gross income. If it does, the excess is a carryforward deduction for the next five years. Your actual benefit will vary depending on your own tax bracket and inherent gain in the stock donated. The more the appreciation the securities have, the greater your tax savings will be regardless of your inherent tax bracket. To donate to BWCF, please download the sample transfer request letter HERE. This contains the information you need to make your gift. It is imperative that you ensure that the transfer is coded as a gift/donation. As we are not your tax advisors, we recommend that your decision to gift appreciated securities to our donor-advised fund program first be discussed with your personal tax advisor to better understand the benefits of this program to you.